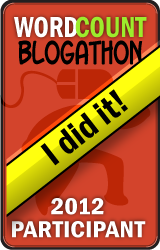 Today's the last day of May, which means that it's the last day of the Blogathon that I've been participating in (and successfully completed, by posting every day this month)! I will still post on my blog, but it will probably be more like once or twice a week instead of everyday. If you're worried about going into withdrawals you are welcome (and encouraged) to visit old blog posts. But some of you have already read them all (several times and commented) thank you! So I wanted to end this month with links to some blogs that I follow that write about similar topics. 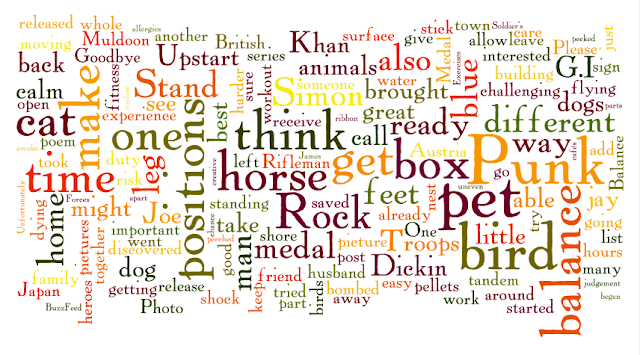 Extraordinary Dogs and Extraordinary Horses are two blogs written by the same person. They are full of resources: research to back it up, grants in case you're interested in working with those animals, and charities if you're looking to sponsor someone else. The author of the blogs is a fabulous person that helped me get set up on linkedin and offered me practical advice for my blog. Animal Friends is a great blog for cat and dog owners looking for more information about their pets. They've posted about such topics as wet food vs dry food, animal allergies, and understanding cat behavior. They also often post about animals that are up for adoption if you are looking for a new pet. I stumbled across Coop and Cottage when I was doing research for my Respect for Chicken Day post. And I am so glad that I did! The author is a wonderful writer that shares her stories about her chickens, her children, and most recently some horses. You should definitely check her blog out! If you want to know what it's like owning a service dog, Life With a Hearing Dog is a good blog to read. This is another blog that I discovered while looking for information for one of my posts (Hearing Ear Dog). I appreciate that she writes as herself and not her dog so you really get to know what it's like. 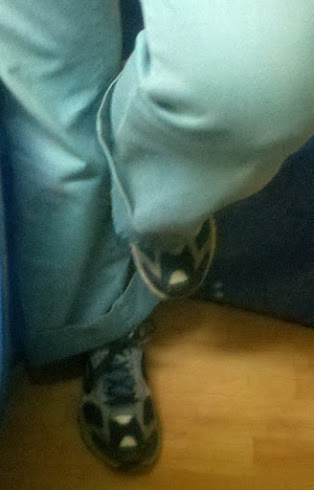 Assistance Dog for Autism is a fun blog by the mother of a young boy with Autism. She writes about her son and his dog's adventures. I think I also enjoy this one so much because they live in Ireland so I get to learn about what it's like there. Dog Nerd 101 is written by a woman that trains her dogs so it's a good resource to learn about training behaviors beyond the normal "sit. stay. roll over." She also is a psychologist so she goes into some of that as well. Do you have any cool animal blogs that you follow? Baylor Health Care System has a team of 90 dogs that help the health care professionals get patients on the road to recovery. Here are some fun videos about the Animal Assisted Therapy program from the dogs' point of view. I wish that they created more videos but I guess they are busy helping people get better, which I'd much rather they do. Do you know of another other programs like this that found a cool way to promote themselves? What do Rifleman Khan, G.I. Joe, Simon, and Upstart have in common? You might think they are all cartoon characters from the popular 80's t.v. series but, they were all very real heroes. Heroes that happened to be animals. These animals have all been awarded the Dickin Medal for "conspicuous gallantry or devotion to duty while serving or associated with any branch of the Armed Forces or Civil Defense Units." Rifleman Khan was a one of 27 dogs to receive the medal. He was a part of the Cameronians (Scottish Rifles) and paired with Corporal James Muldoon. One night in 1944 the two of them were on a boat together on their way to an important battle when they were spotted and fired upon. Rifleman Khan was able to swim to shore, but he discovered that Muldoon was not a swimmer. The dog went back while still under fire and brought his handler to shore, dragging him far enough out of the water to be safe. G.I. Joe was one of 32 birds to receive the medal. This pigeon saved an entire town in Italy from being bombed. Calvi Vecchia's bombing was scheduled for October 18, 1943 but G.I. Joe brought the message to the Allied Troops that the town had already been taken by some British Troops just in time. His speed saved over 1,000 lives including both the villagers and the British Troops. Simon was the only cat to receive the medal. He started as a sickly stray cat that was stowed away on the HMS Amethyst. He quickly earned his keep on the ship by keeping the rat population in check. After an attack by the Chinese that killed Lieutenant Commander Skinner and seriously injured Simon you'd think that he'd retire. Instead Simon raised the men's morale by continuing his job of catching rats. 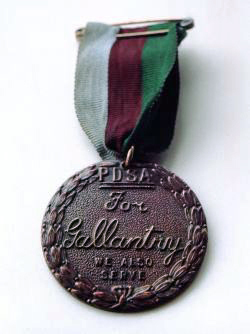 Upstart was one of 3 horses to receives the medal. He was a police horse on duty when a building was bombed near him. With the glass and other building parts flying around, not to mention the noise, you'd think that the horse would spook. Not Upstart. He was recognized for his ability to remain calm at that time, allowing his rider to direct traffic and maintain order. If you're interested in reading about the other Dickin Medal recipients, wikipedia has a great list. Keep in mind that the award has been given out 63 times, so if you prefer a shorter list BuzzFeed has chosen 15 they think are the coolest. I previously wrote a post about Roselle, another dog that received the Dickin Medal, after helping her owner get out of the Twin Towers and to safety on September 11th. Sweet pity’s tear, "Goodbye old man, Goodbye"." Please go here to read the whole poem. Today is a day to remember all of our fallen heroes both human and animal. Yesterday when I got to the zoo, a man was dropping off a baby blue jay. 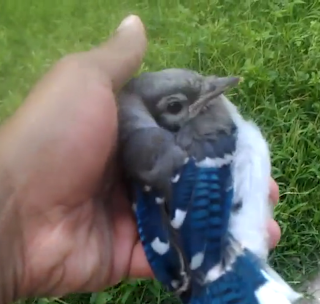 The man had witnessed another bird picking up the little blue jay and throwing it out of the nest. The little bird was in shock when we peeked into the box. He wasn't moving and we weren't sure if he was going to make it. putting some leaves in the bottom. So we left him in there in a dark room to give him some time to calm down with the plan that I would take him home to release him if he seemed ok.
A few hours later, I was getting ready to leave so I went to grab his box, but he wasn't in it! 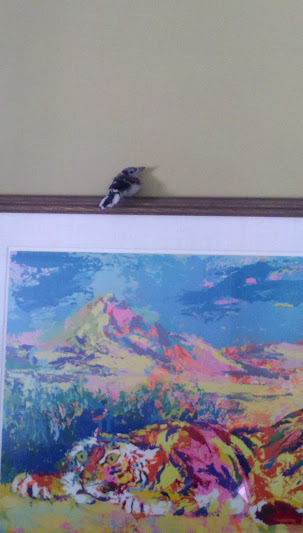 We started searching around on the floor for him, when someone discovered him perched on a picture. As we tried to catch him, we realized that he had no trouble flying. This was a good sign. He also cawed at us. Another good sign. 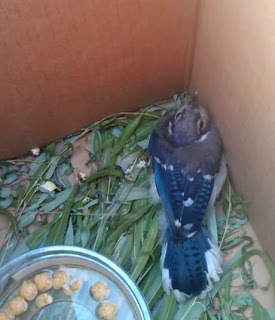 Once back in the box, I was sent home with the bird, some pellets and instructions to feed him and release him. Unfortunately, the ride home must of shook him up a bit. (I do live in New Orleans, known for bad roads with many large, unavoidable potholes) He was again acting as though he was in shock. Punk Rock with his food. 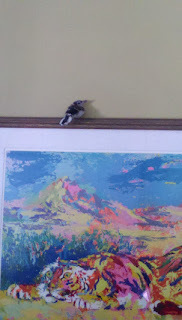 My husband was so excited to have the blue jay in the house. 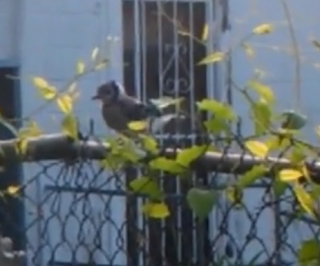 He named it "Punk Rock" and whistled his "signature bird call" to Punk in hopes that the bird would recognize him once released. We left him in the box, with the pellets soaked in water, overnight to give him a chance to eat and calm down. This morning we awoke to Punk Rock's calls. He was feeling better and ready to get out. Punk Rock is getting ready to take off! My husband took Punk Rock out of the box and walked a few steps with him before he took off. We were happy to see him fly away and call, but at the same time a little sad. Having that bird here for less than 24 hours was a great teaching experience for us. We aren't parents (yet) but allowed us to see how that might work. It was also a great lesson in compassion. Punk Rock is released into the world. If you are interested in learning more about blue jays, Cornell Ornithology is a fabulous resource with information, pictures, videos and audio recordings. 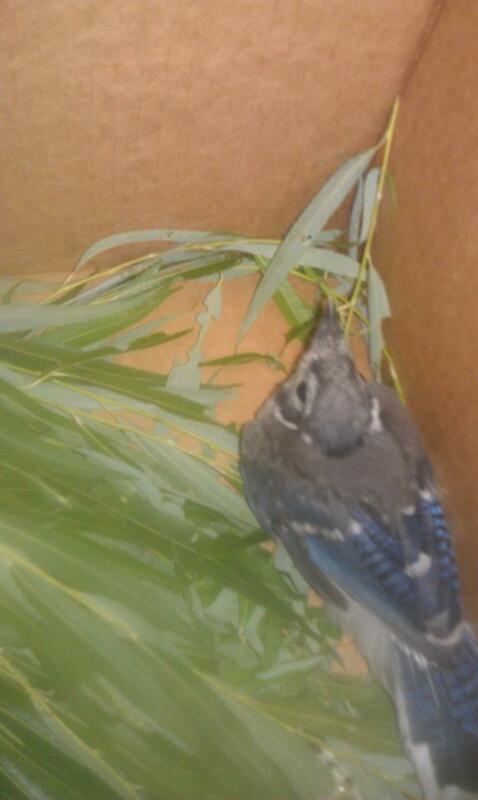 **Note** If you see a young bird on the ground, it's best to leave it there so the family can take care of it. Most birds do not have a sense of smell so you can also put it back in the nest if you can reach it. But it's not advisable to try and raise a wild animal on your own. Several public places are open to dogs, but in Japan and now Austria there are restaurants that do not allow dogs. And not for the usual reason. It is to protect the cats that call the cafés home. There's a whole collection of pictures here. 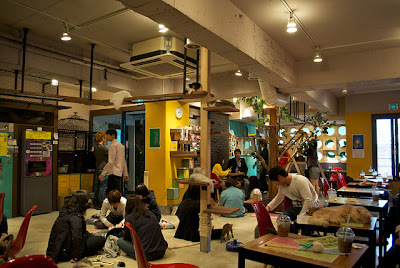 These cafés offer cat lovers, who might not be able to own a cat due to pet restrictions or allergies of a family member, a place to hang out with some friendly felines. This interesting trend began in Japan as a way to allow people to relax. One Japanese woman brought the idea with her when she moved to Austria. She was just able to open her shop recently. When do you think they will make their way to the US? This blogathon (and my friend and fellow blogger, Veronica) are pushing me to do things with my blog that I've been wanting to do. 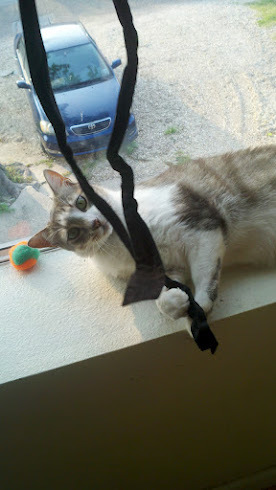 Today's post is the beginning of a once a month series "Exercises You Can Do With Your Pet". Please let me know what you think! Balance is an important aspect of fitness. Deficits can be an indicator that someone has a high risk of falling and will likely experience hip fractures. As with other fitness related aspects, balance can be improved through practice, but who wants to stand on one leg for several minutes? There's an easy way to integrate your pet into your balance workout making it more fun for both of you. Balance can be practiced many different ways; I've listed some from easy to hard. I'd suggest starting with the easier ones at first especially if you are doing them with your pet. Once you both get used to it, you can move to the harder positions. 3. 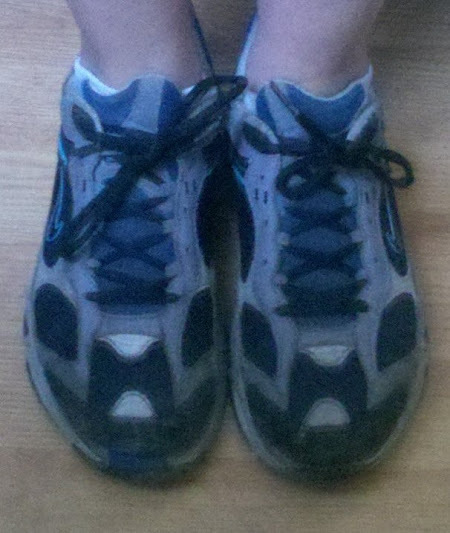 Stand with feet in tandem. 4. Stand on one leg. You can also make it more challenging by changing the surface that you are standing on. 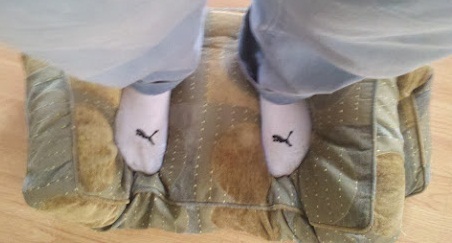 Find a foam cushion or rounded surface and go through the positions again. NOTE: when you're on uneven surfaces, make sure that you are barefoot, and start out with your feet shoulder width apart. Work up to the harder positions. Now it's time to add your pet! If it's a pet dog, play fetch while in the different positions. Throwing a ball is going to add to the workout and make it more challenging to balance. 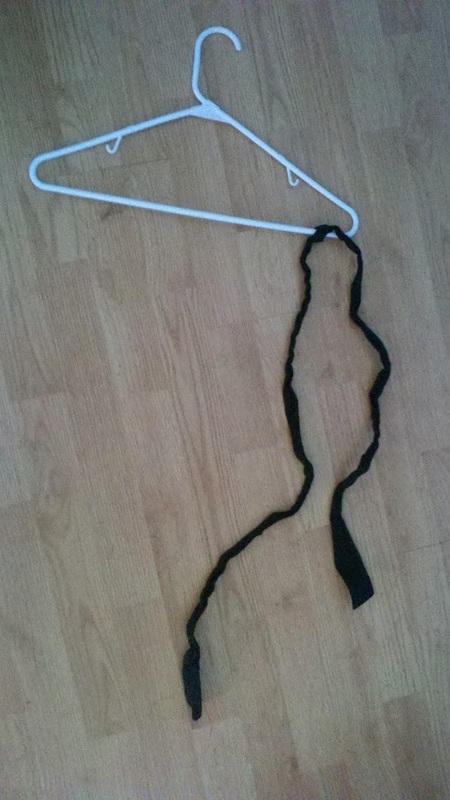 If it's a pet cat, wave a stick with a ribbon on the end for your cat to chase while you're in the different positions. Again, moving the stick will challenge your balance. If it's a pet horse, brush the horse while in the different positions. Get creative if you have other animals as pets! As you work on balance you are activating your core muscles to keep you upright. If you get to the point where you are standing on one leg, you are strengthening that leg. So you get increased muscle strength and balance and the best part is that you get to spend time playing with your pet! Disclaimer: I am not a doctor. Use your best judgement when you are participating in these activities. Do not try if you are already at risk for falls unless cleared by a health care professional. Copyright: Sarah Allen 2011-2012. Simple theme. Powered by Blogger.